SONIC Drive-In franchise business opportunity. 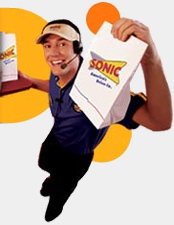 Free SONIC Drive-In business franchise information. <?xml:namespace prefix = o ns = "urn:schemas-microsoft-com:office:office" />Join the Largest chain of Drive-In restaurants in the Nation! SONIC has been doing just that since 1953. Along the way, we've managed to become the largest chain of drive-in restaurants in the nation. What makes SONIC different from other franchise opportunities? A big part of the SONIC difference is the belief that "owners make better operators." In fact, SONIC franchisees enjoy one of the most successful businesses and one of the lowest turnover ratios in the quick-service restaurant (QSR) franchise industry, with unparalleled opportunities for personal success. Satisfied customers are one of the best measures of a company's success, and SONIC maintains one of the highest customer frequency rates in the industry. For two years in a row, we have received the overall Gold Winner for the burger division of Restaurants & Institutions' Annual Choice in Chains Award. Drive-In Concept: Customers can park their cars and order without waiting in a busy drive-thru line. Convenience: Customers order from their cars. There's no need to walk up to the counter thanks to the intercom, and the canopy provides shade and weather protection. Great Service: Carhops deliver food straight to every customer's car. Great Food: Hot, fresh food is made-to-order and whatever way customers want it -- with extra jalapenos, pickles, chili, etc. Unique Menu Items: The Extra-Long Cheese Coney, Steak Sandwich, Tater Tots, Onion Rings, Toaster Sandwiches, Ched 'R' Peppers and Mozzarella Sticks are distinctively different SONIC menu items that customers crave. 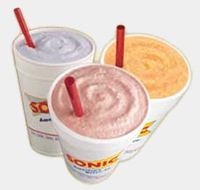 Fountain Favorites: SONIC is known for its Cherry Limeades, Ocean Water™ and fresh fruit Slushes. Frozen Favorites: Many customers specifically drive to SONIC for a Banana Split or Premi-YUM! shakes like our award-winning Cream Pie Shakes and Chocolate-Covered Shakes, Floats and Flurry drinks, SONIC Blast desserts, cones and dishes. Most of SONIC's new menu creations are pioneered by entrepreneurial franchisees. This was the case with SONIC's highly successful Frozen Favorites dessert menu expansion in 1996. This spirit of cooperation has only been reinforced by the success it has afforded all of us. Average unit sales have increased each year since 1987. System-wide sales have doubled in the past five years. Hamburgers are the largest segment of the QSR, with annual sales of about $40 billion, and faster-growing revenues than any other segment. The term of a SONIC franchise is 20 years, plus a 10-year renewal. The franchise fee is $30,000, with a total initial investment ranging from $710,000 to $2.3 million. You must have prior or current successful restaurant experience and/or strong entrepreneurial skills. Royalty fees are 1 to 5 percent; advertising fees are 4 to 5 percent. You must have a minimum net worth of $1 million with $500,000 liquidity. To learn more about the SONIC Drive-In restaurant franchise opportunity, simply complete the form below.